Purchase tickets to American Son online, at the theatre box office, or by calling 212-239-6200. Lee Shubert built the Booth Theatre in partnership with the producer Winthrop Ames. 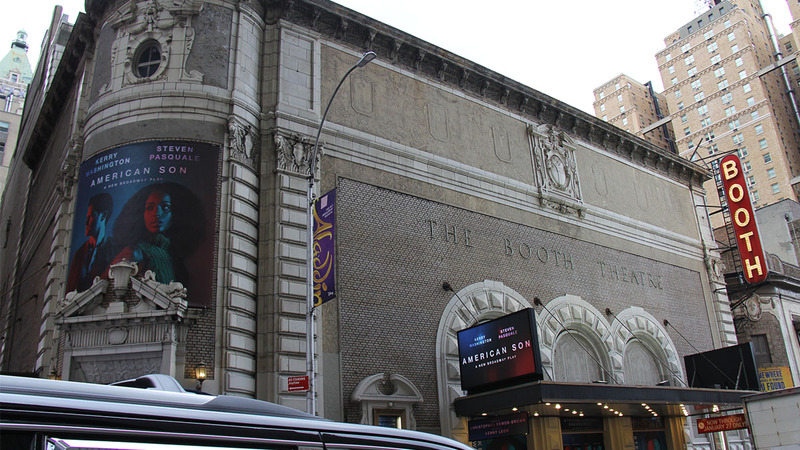 Named for the actor Edwin Booth (1833–1893), brother of the infamous John Wilkes Booth, the venue was actually the second New York theatre to bear this name. The first was built by Booth himself in 1869 on 23rd Street and 6th Avenue. 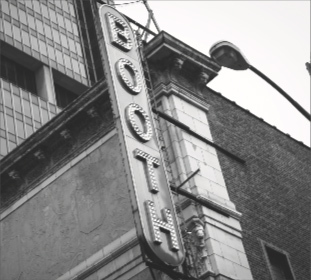 Ames’s father had been devoted to preserving the actor’s legacy, so Winthrop’s decision to name this theatre after Booth honored not only the actor, but it connected his own family’s interest with the actor’s rich theatrical history. Ames intended to present the most challenging and prestigious productions possible here. 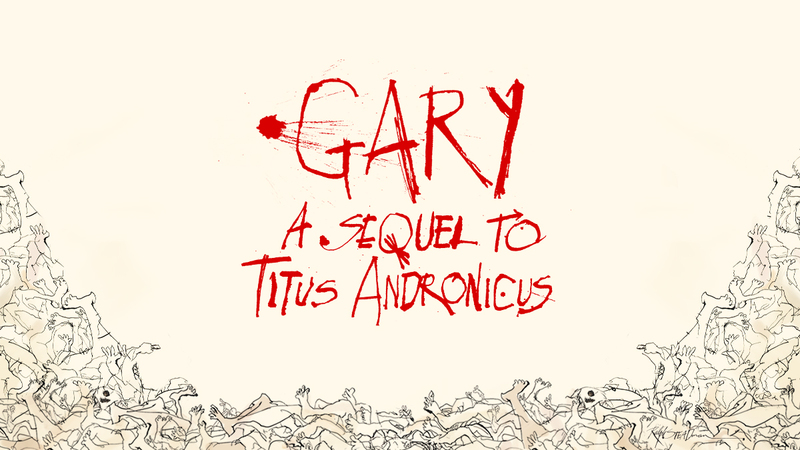 Gary: A Sequel to Titus Andronicus is currently playing at the Booth Theatre. The Booth Theatre has 800 seats and is one of the Shubert Organization‘s 17 Broadway theatres. American Son is recommended for ages 14 and older. Children under the age of 4 will not be permitted in the theatre. A wheelchair-accessible restroom is located on the main level. The women’s restroom is located in the lower lounge and upstairs in the Mezzanine. The men’s restroom is located in the lower lounge. Mezzanine location: Located up two flights of stairs (31 steps). Please note, once on the Mezzanine level there are approximately two steps up and down per row. Entrance to Mezzanine is behind row H.
The Booth Theatre provides at least 10 infrared assisted-listening devices for every performance at the theatre. Beginning four weeks after a show’s official opening-night performance, at least 10 audio description devices are available for every performance at the theatre. In addition, there is unlimited access to downloadable audio description software for personal mobile devices, available beginning four weeks after a show’s official opening-night performance, which provides an automated detailed account of the visual of the production, free of charge, for blind or partially sighted patrons. The theatre also offers handheld devices and software that provide captioning for deaf or hard-of-hearing patrons, available beginning four weeks after a show’s official opening-night performance. Additional devices can be available with at least 24 hours’ notice by contacting Shubert Audience Services at 212-944-3700 or [email protected]. There is also a representative at the Shubert Audience Services kiosk at every performance to assist any patron with the audio description devices, software, or captioning devices. Built by Lee Shubert and producer Winthrop Ames — and named for actor Edwin Booth — this warm, intimate Shubert theatre opened on October 16, 1913, with The Great Adventure. The most recent productions here were Amy Schumer in Meteor Shower; Significant Other; Les Liaisons Dangereuses; An Act of God; Hughie; Hand to God; The Elephant Man starring Bradley Cooper; The Velocity of Autumn; a revival of The Glass Menagerie; and I’ll Eat You Last: A Chat With Sue Mengers, starring Bette Midler. Jon Robin Baitz’s Other Desert Cities was the fifth Lincoln Center Theater production to play the Booth, after Dividing the Estate, Edward Albee’s Seascape, Via Dolorosa, and a revival of The Most Happy Fella. Other recent productions have included a revival of Who’s Afraid of Virginia Woolf? starring Tracy Letts and Amy Morton; High, with Kathleen Turner; the Tony and Pulitzer Prize winner Next to Normal; The Story of My Life; Thurgood; The Seafarer; The Year of Magical Thinking; Butley; Faith Healer; The Pillowman; The Good Body; The Retreat From Moscow; Our Town starring Paul Newman; Bea Arthur on Broadway: Just Between Friends; the return engagement of The Search for Signs of Intelligent Life in the Universe; and Dame Edna: The Royal Tour. For Colored Girls Who Have Considered Suicide/When the Rainbow Is Enuf. Other highlights of the 1970s included a revival of Jerome Kern’s Very Good Eddie; All Over Town, directed by Dustin Hoffman and starring Cleavon Little; Terrence McNally’s Bad Habits; and That Championship Season. The 1960s brought Leonard Gershe’s Butterflies Are Free, starring Eileen Heckart, Keir Dullea, and Blythe Danner; Harold Pinter’s The Birthday Party; Flanders and Swann in At the Drop of Another Hat; Luv, directed by Mike Nichols; and Julie Harris, Walter Matthau, and William Shatner in A Shot in the Dark. Paddy Chayefsky’s The Tenth Man; Two for the Seesaw, with Henry Fonda and Anne Bancroft; Gore Vidal’s Visit to a Small Planet; An Evening With Beatrice Lillie; and Come Back, Little Sheba with Shirley Booth and Sidney Blackmer winning Tonys, all played the Booth in the 1950s. Early hits here included The Lunts in The Guardsman (1924), Pulitzer winners You Can’t Take It With You (1936) and The Time of Your Life (1939), and The Two Mrs. Carrolls (1943).